First .. for the first time .. we'll enjoy a wonderful half hour meditation guided by Dr. Keith Blechman. Keith is a surgeon who graduated from our first teacher training program and who now teaches mindfulness to doctors across the country. He's super humble (not a word commonly associated with surgeons, I know! ), and his story of wanting to spread mindfulness in the medical community is really inspiring. Yay to Keith guiding The Path for the first time! After Keith's meditation we're excited to welcome author Cheryl Einhorn to speak about her new book, Problem Solved. Cheryl is an EXPERT in teaching people to make better decisions in all areas of their lives, including jobs, romance and more. On Tuesday, she'll share her special technique to help people make thoughtful, confident decisions - join us to hear more! We'll gather in a new spot Tuesday, a beautiful co-working space called Industrious .. that's super convenient, RIGHT on Union Square. AND to give you no excuse not to join, we're offering everyone at The Path half off the meditation this Tuesday and including the talk for free. Yes we're feeling generous and giving, because Tuesday is going to be awesome :). 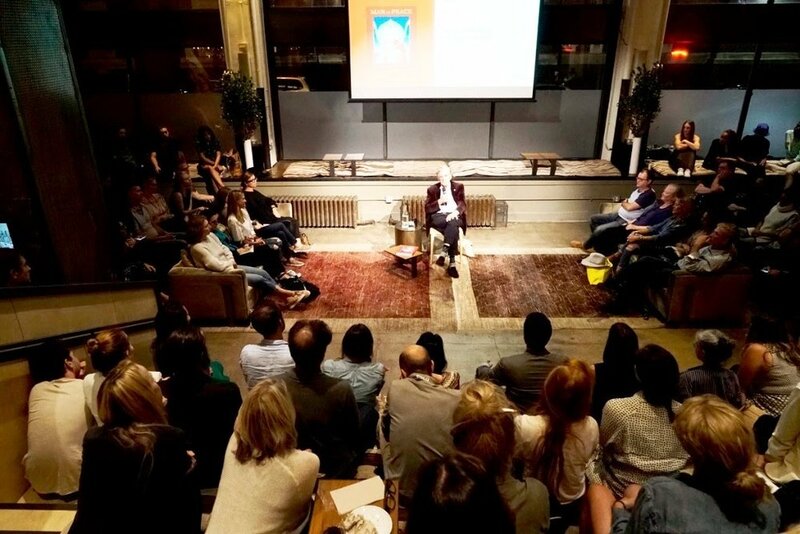 And, wow, a huge thank you to everyone who joined us for Robert Thurman last week. What a night! Thank you for adding your warmth and beautiful energy to a truly special evening. We <heart> you and can't wait to be part of another great gathering this Tuesday. p.s. Yes we're really offering 50% off our meditation and the talk on making better decisions Tuesday(which will be great). Click here to join us! I come from the fast-paced NYC start-up world. I thought I could never show weakness. Or fear. No feelings! But let me share a little "secret". We all get scared. We all feel alone sometimes. We all have moments of complete terror when we meet one of our heroes. But here's the cool part .. The moment we acknowledge it. The moment we allow ourselves to feel it. That's when everything changes. It kind of blows my mind that I'm hosting a dinner and retreat with one of my mentors this weekend and that's it almost sold out. Because the first time I had a chance to actually meet her, I was petrified. My hands were sweating. My heart was pounding. I felt like I was going to throw-up. But I'm getting ahead of myself... let me give you some context. I first heard about Sharon Salzberg when I was helping to run a tech company. I was stressed out of my mind. I didn’t know what to do or how to handle it. I wanted to meditate but didn’t know where to start. Every time I actually tried to do it, I thought I was doing something wrong and would just wind up getting more stressed .. and feel frustrated and stop! I went to guided meditations all over the city but nothing felt quite right. I couldn't connect or identify with these people. I never felt "apart of." I didn't feel surrounded by people like me - a founder, super ambitious, surrounded by other entrepreneurs who wanted to learn meditation mainly to feel sane. To stop, even for a second, the churning of my mind which swirled in circles of stress worse than a cyclone. The teachers whose classes I attended kept talking about the luminaries of meditation in the U.S. I retained only two names: Jon Kabat Zinn for mindfulness and Sharon Salzberg for loving-kindness. At that point in my life, I didn't feel any real "loving kindess" for myself, so I began to use Sharon's name as a "makeshift mantra" of sorts, and I would somehow always feel better once I did. I didn't really think I would ever meet her. I didn’t know where she lived, but I assumed it was on a mountain, maybe somewhere in Tibet or Nepal or somewhere else where she could meditate all day and think deep thoughts. It felt really, really different from my life. One day a friend invited me to a meditation Sharon was leading. I couldn’t believe she was in NYC! I couldn’t believe I could ever be in the same room with a teacher as famous as she was. Heck, this was the woman who literally wrote the book on loving-kindness and is often credited with bringing compassion meditation from the East to the West and helping to make it mainstream! I loved the first three of these phrases and used them for a half hour sit with Sharon that night. Sitting, still, at the back of the room, afraid to move up or to say hi. That evening I went back to work, as was my life as a tech founder, and I’ll never forget what happened. I answered emails from partners and from people on our team. And I was funny! I was kind. Something had "shifted". Sharon’s phrases became my daily practice. It was the one respite in stressful days of press interviews, meetings, calls and panic attacks (that I didn’t tell anyone about). As you can probably guess that’s when I really *found* meditation. I ended up studying around the world. And I had the inspiration, on a 10-day retreat in India, to start The Path — and to bring meditation back to the US and try helping people avoid the panic attacks and burnout I had suffered living a hectic "always on the go" life for so many years. Eventually, I was ready to go back to NYC. As a new, better version of myself. And to launch The Path community. On our first month, my co-founder and I made a dream list of people we wanted to partner with. Sharon topped the list. We laughed and said to each other — if we can ever do anything with Sharon, we’ll know we will have made it. And we will have accomplished our goal of offering to the next generation of change-makers — the best meditation teachers in the country. A few months after we launched a friend invited me (yay!) to a gathering of some of the top thought leaders in meditation in the city. I saw Sharon on the invite list, too. I couldn’t believe it. I opened the door to the event and took a deep breath. A group of people were there. Including Sharon. But within a few minutes, someone introduced us, telling Sharon that I had just started a community called The Path, and asked me to explain our concept to see what she thought. Want to know what's so crazy about all this? I’ve never been so scared to speak in my life. And then I held my breath. I was, in a word, terrified. And I breathed a sigh of relief. I came back to the gathering the next month. As did she. Now, two years later, Sharon is a dear friend. We know we're both night owls (shhhh), so we email funny things to each other at all hours. I helped her choose the font for her new book. And I forward her silly emails from my mom extolling the virtues of empathy :). We were both at the Wisdom 2.0 conference and walking to the bathroom after a session. I held my breath and asked her to lead a retreat for us. And without hesitating — my hero, mentor and teacher said YES! In that bathroom we closed the deal for her to lead her first retreat for The Path, last September. This year we wanted to do something cool, and she had the idea to lead a seder. I thought she was kidding but said I would call her bluff and say yes, let's do it! She wasn't kidding. So on Friday we're doing it. She'll play rabbi and lead a "Jewish-Buddhist non-denominational vegan seder" (her name, her idea). I couldn't be more excited for this event. Because I know she will help you in the way she helped me. To breathe, live and love again. And I also want to help her. I want to help bring her new book to bestseller status. So I'm thrilled we'll have a "day of love" retreat with her about the book Saturday. And that we're asking everyone who joins to buy a copy of her book. Or two. I WANT to help this woman who's changed my life so much for the better to get to bestseller status on her new book the week it's released. That's why we're asking people to buy books to attend the dinner and the retreat. Sharon is one of my favorite people in the world. On Friday I almost can’t believe I have the honor of introducing one of my life mentor’s and inspirations. As our teacher. For the weekend. I hope you can join us and see how she can change your life for the better, just as she has changed mine. and experience the "Sharon magic" yourself.